O Root of Jesse, which standest as a sign to the peoples, at whom kings shall shut their mouths, whom the gentiles shall beseech, come to deliver, delay thou not! This particularly beautiful painting of the Tree of Jesse, which is referred to in today’s O antiphon, is attributed with some uncertainty to a Dutch painter named Gerrit Gerritsz, generally known as Geertgen tot Sint Jans, of whom very little is known for certain. His birth is placed by conflicting sources ca. 1455 or 1465, in either Harlaam, where he also died at the age of about 30, or Leiden. The nickname “tot Sint Jans” refers to his membership in the Knights of St John of Jerusalem. Like many Dutch and Flemish artists of the period, he revels in delicate colors and extremely very fine decoration. 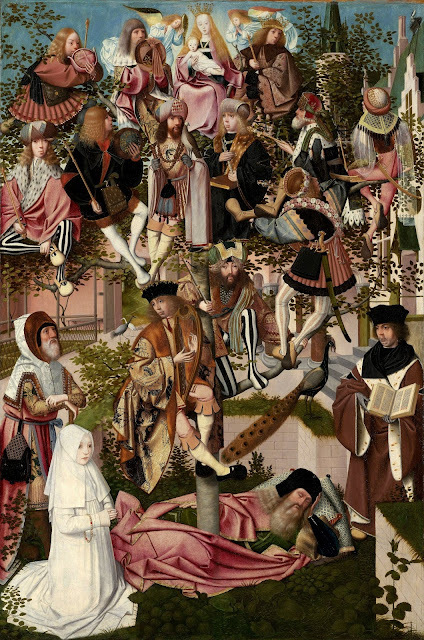 The subject, the line of kings from David to the Virgin Mary, offers an opportunity to dress his figures in refined clothing with many small details. Abia, (next to Solomon, shown from behind) wears both a crown and sash of roses, while Josaphat’s necklace is made of larger and smaller beads, both of which remind one of the rosary. (The Dutch word for “rosary - rozenkrans” literally means “crown of roses.”) In this regard, it should be remembered that the root of Jesse was long associated by the Fathers with the Virgin Mary. As St Jerome writes in his commentary on Isaiah 11, “We understand the rod (virga) from the root of Jesse to be the Holy Virgin (virgo) Mary.” This passage is read in the Breviary of St Pius V in the second nocturn of the Second Sunday of Advent, commenting on the reading of the first nocturn, Isaiah 11, 1-10, which begins “And there shall come forth a rod out of the root of Jesse, and a flower shall rise up out of his root.” Jerome continues, “the flower we understand to be the Lord and Savior, who says in the Canticle of Canticles, ‘I am the flower of the field, and the lily of the valleys.’ ” The garden refers to the words of Canticles 4, 12 “A garden enclosed is my sister, my spouse, a garden enclosed, a fountain sealed up”, which are constantly used as an image of Mary’s virginity. The kneeling nun in the lower left, who is holding a rosary, was at one time painted over with an extension of the brick wall next to her, perhaps even by Gerritsz himself; she was uncovered by a restoration in 1932. The man behind her may be the prophet Isaiah, who is of course the prophet of the Virgin Mary par excellence. The man on the lower left, richly dressed and holding a book, may be the rector of the convent or charitable institution to which the nun belonged. Finally, we should note to the left of the man a peacock, the symbol from very ancient times of the resurrection of the body and eternal life. This painting has been in the Rijksmuseum in Amsterdam since 1956.